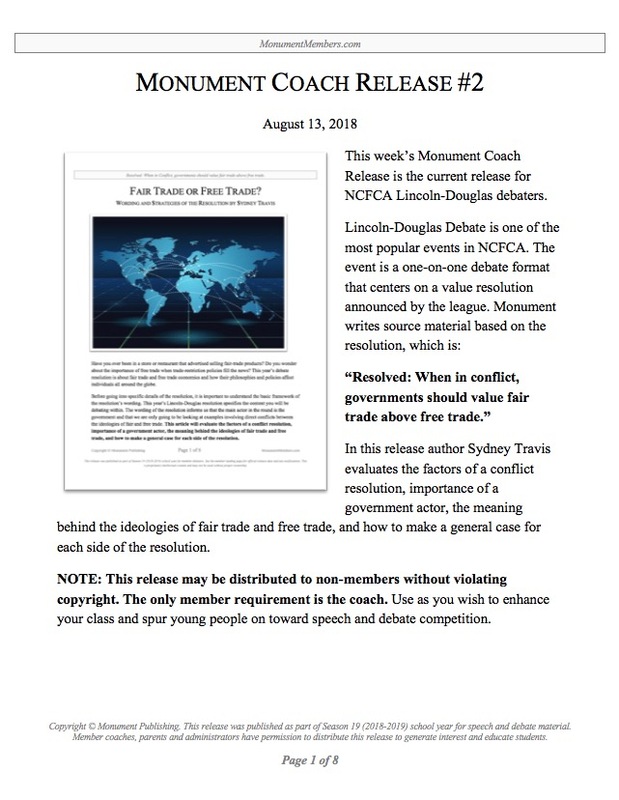 This week’s Monument Coach Release is the current release for NCFCA Lincoln-Douglas debaters. Lincoln-Douglas Debate is one of the most popular events in NCFCA. The event is a one-on-one debate format that centers on a value resolution announced by the league. Monument writes source material based on the resolution, which is: “Resolved: When in conflict, governments should value fair trade above free trade.” In this release author Sydney Travis evaluates the factors of a conflict resolution, importance of a government actor, the meaning behind the ideologies of fair trade and free trade, and how to make a general case for each side of the resolution.